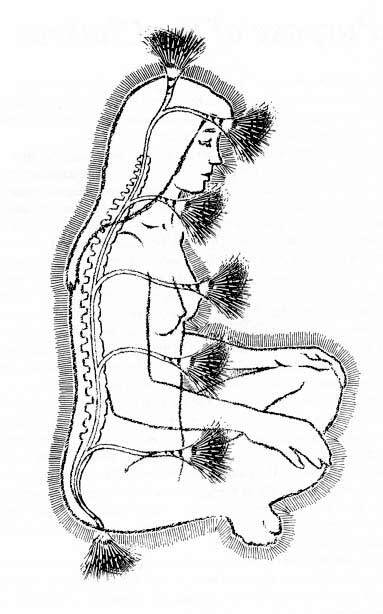 I see it as the root and crown chakras acting as openings so their orientation are different to the vertical human body. However, root chakra connection to the spine appears to start at the coccyx even though there is no spinal cord ending there per se --but of course including perineal region and that general area. The cauda equina (horse tail) makes a nice design for absorbing via the so call body's south pole, I think. The the rest of the nervous system makes the major and minor different connections to the different organs and parts of the body. The other chakras appear to have a different orientation but it seems to me, that in the body they are connected at the spinal cord/brain level. Brain level being the indigo and somewhat the crown chakras. As to measurements, I do not know. the question is where 2nd chakra starts and ends. what i know is it ends near solar plexus, which is a very narrow band. but the red chakra vs orange chakra is the question that remains still.